Every day, many workers around the world are exposed to potentially harmful levels of noise. It is essential that regular noise exposure monitoring is carried out for compliance with the Noise at Work Regulations. Long term exposure to harmful levels of noise can lead to serious health and safety issues such as occupational hearing loss or tinnitus. Occupational hearing loss is typically caused by repeated exposure to moderately loud noise or, more rarely a single exposure to loud noise such as a ‘loud bang’. It is important to remember that noise-induced hearing loss in a work environment is totally preventable with the help of the right monitoring and control measures to reduce the risk from excessive noise levels. It is a legal requirement to ensure workers are not exposed to levels of noise exceeding the recommended levels in the Control of Noise at Work Regulations (2005). The cost to businesses that have had to pay compensation for noise-induced hearing loss resulting from workplace exposure has risen sharply in recent years. 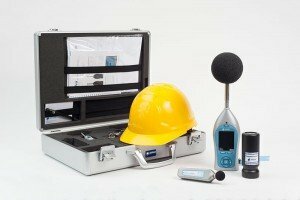 Accudata Limited supply noise measurement equipment to help safety professionals determine if workers in an industrial environment are being exposed to noise levels which could damage their hearing. To speak to us about your noise measurement requirements, call us on 01773 513222 or email info@accudata.co.uk.